This is a childhood meal I used to beg my dad to make me all the time. There are so many memories around this dish that really warms my heart up just eating it. Traditionally, family dinners would always be together at the table, with no TV. It’s family time. Having dad’s beef and onion soy sauce noodles however meant cozy dinner time in front of the TV with mom and dad while watching Star Trek or X-Files. 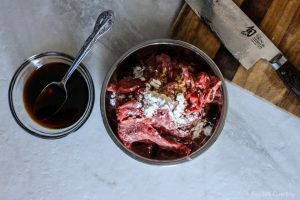 It’s one of my fondest food memories as a kid, which is why it makes this recipe so close to my heart. Now that I’m somewhat grown up, I appreciate the simplicity and amazing flavors of this quick recipe on a different level. You can literally whip this up in 15 minutes and would you believe it uses spaghettini? You may use any type of noodles in its place but there’s something about the slippery texture of the spaghettini that gives this dish a wonderful texture and flavor. 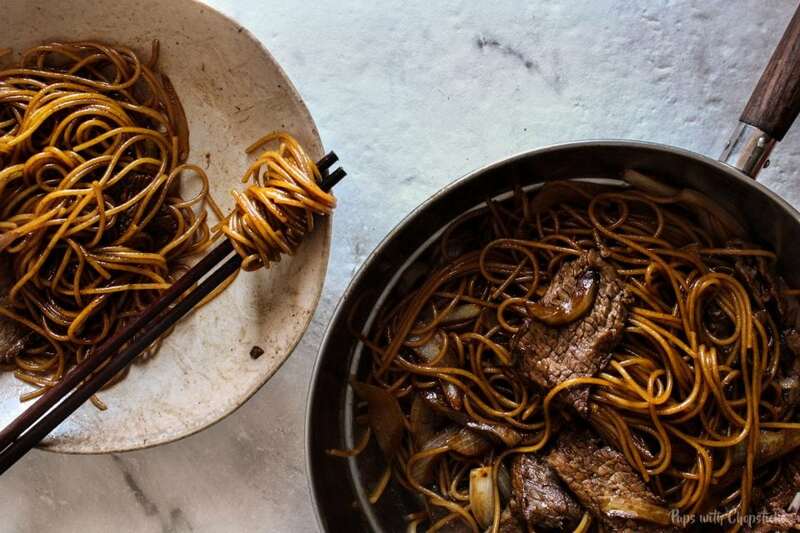 For this soy sauce fried noodles, all ingredients should be available at your local grocery store. For the cut of beef, I would say you can use any cut of beef. It will be sliced thinly so you don’t need to worry too much if it’s a tougher cut of meat. 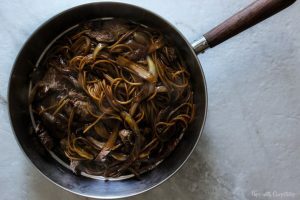 My dad used to use flank steak in his recipe, but I found that a bit on the pricier side so we used ‘steak tails’ which are essentially a sirloin which was inexpensive but very flavorful. Tip #1: Do not add salt to the water for boiling the pasta. 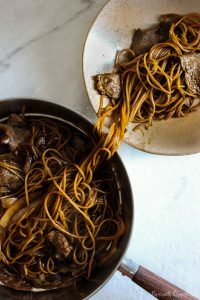 You will be using a sauce to stir fry the noodles and you don’t need the extra salt from cooking the pasta – it will make the pasta extra salty which is not what we want. Cut the onion in half, and then slice it into thin slices. Combine the dark soy, light soy and sugar into 1 bowl. Cut the meat thinly against the grain and put it in a bowl. Add 2-3 teaspoon of the sauce with 1 teaspoon of corn starch (optional) on the sliced meat and mix it and set it aside. In a frying pan (preferably non stick pan), add 2-3 tablespoons of oil and set it on high heat and wait until it is hot. Add in the onions and cook it for 3 minutes until soft and golden. Add in the beef and cook it for 3-5 minutes until it looks done. Add in the spaghettini and add the sauce on top everything and cook for 2-3 minutes until everything is nice and brown and evenly mixed. 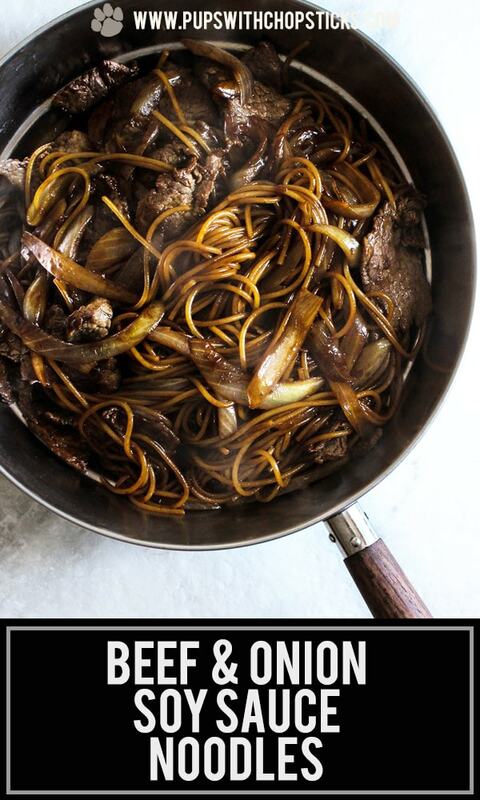 This quick, easy and super flavorful soy sauce fried noodles recipe is made with stir fried beef and onions – ready in 15 minutes! In a frying pan (preferably a non-stick), add 2-3 tablespoons of oil and set it to high heat and wait for it to get hot. Do not add salt when boiling the pasta, we will be using a sauce to flavor the pasta when we stir fry it and adding salt to the water will make the dish overly salty. I got all the ingredients besides the corn starch do I really need it? Hi, I’m just wondering can I use just regular soy sauce for the entire recipe and exclude the dark soy sauce? What will I be missing in taste if I do this? 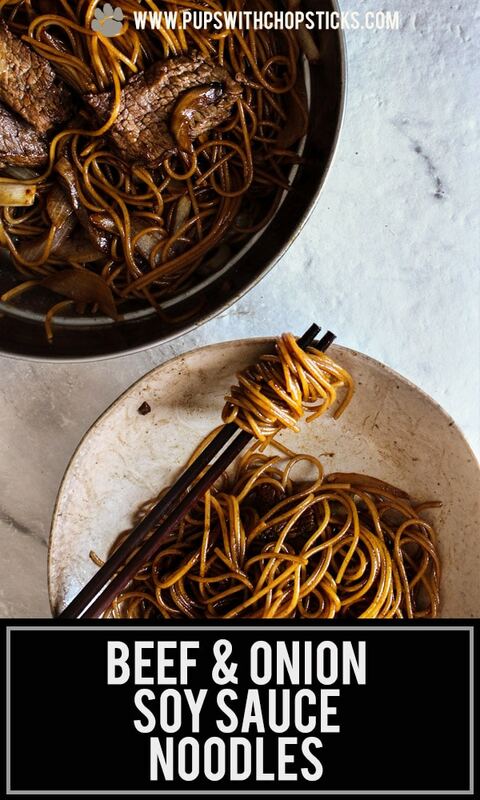 The syrupy consistency of dark soy provides the brown colour of the noodles and a bit of saltiness. 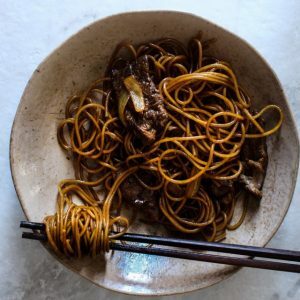 Dark soy is actually less salty than regular soy sauce so if you want to omit it, you can replace it with half the amount in soy sauce (so in this case 1-2 to 3/4 tablespoon of regular soy sauce) and you won’t be missing much except the dark brown colours of the noodles 🙂 Hope this helps! Super easy to make with the detailed instructions. Everyone in my house loves it! That’s not always an easy job. 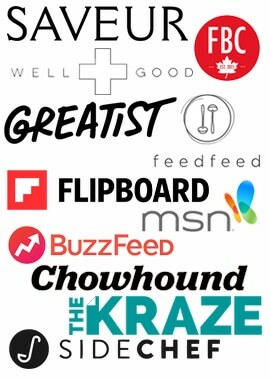 So thank you for sharing! 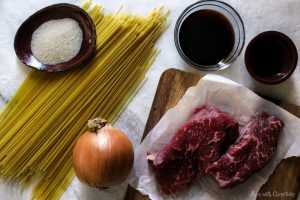 Ι love this recipe, and the photo with the pan and the plate joined together with the spaghetti is awesome! P.S. X-Files?! I never missed an episode! Very good tasty, congratulations to the site. Joyce!! This is like one of my favorite dishes EVER!! 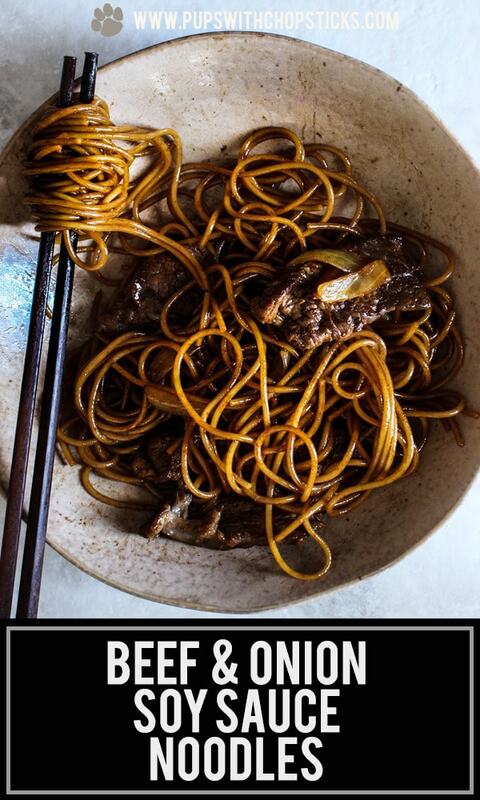 I always order a similar noodle dish at a nearby super authentic Chinese place with questionable cleanliness. Now I don’t have to worry about the questionable cleanliness part because I can make it at home!! YES!! This recipe looks perfect and so easy to make. Thanks, Joyce! This looks so comforting!! Do you think chicken will work instead of beef? Thanks Maria! 🙂 Yes this would work wonderfully with chicken! and if you want to go the vegetarian route, you can even use mushrooms. 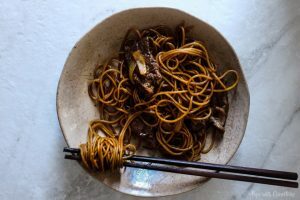 I love how simple and quick this recipe is and it’s is so flavourful with the soy sauce coating everything! Yum! Such a great idea to use spaghettini too! there’s something about cornstarch-ed meat that is so comforting to me. it’s so tender and that slight chemical taste (which sounds bad when i put it like that sigh) is pure childhood to me. paired with glossy soy sauce noodles and i am a (happy) goner. 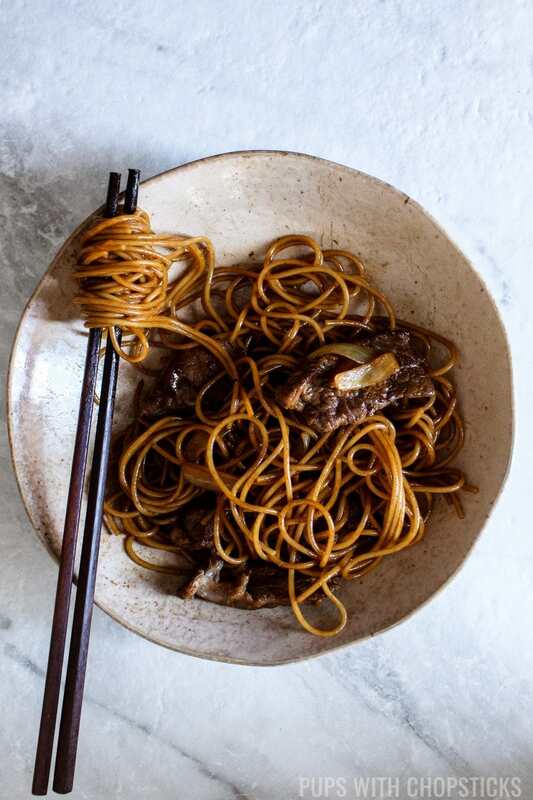 This quick beef fried noodle recipe looks perfect! I love how few ingredients are combined quickly to create a delicious comfort food. I’ll definitely give this a try soon, my daughter super loves soy sauce, I’m sure she’ll love this! Thanks! Wow. Umami bomb. Nice, simple and delicious. And fast. Absolutely no need to compromise on dinner on a busy night with recipes like this! 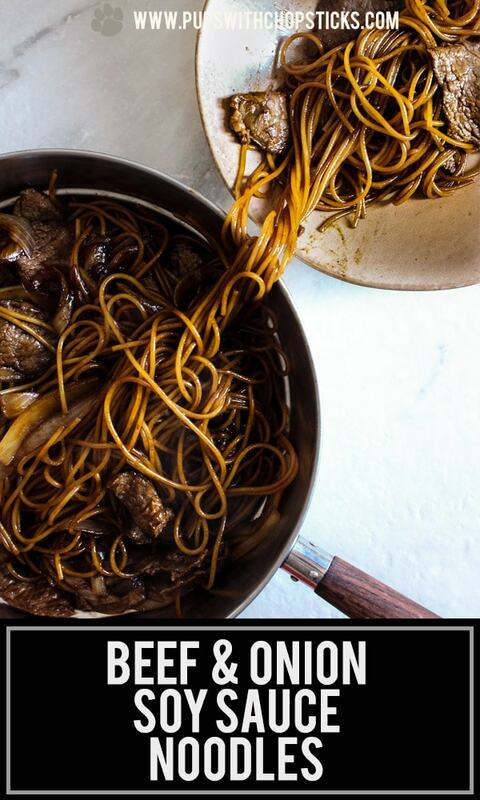 I love a good, quick, stir fried beef and noodle dish. 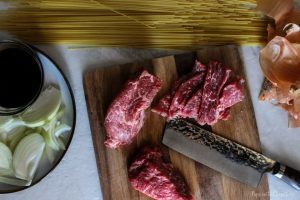 What are steak tails exactly? They look really good in your pics but I’ve never seen anything with that name around here.